(Photo-shy) friends came over this weekend, so of course I wanted to feed them something special. However, I realized the night before that our bountiful berries had just passed their peak and we only had about a quart on the bushes. How do you make a quart of raspberries feed five people? Stretch it with chocolate, of course. Preheat the oven to 350 degrees Fahrenheit and butter a 9-by-13-inch cake pan. Toast the almonds until they're lightly brown, then grind them for about 5 minutes in a food processor until the nuts start to release their oils. Meanwhile, melt the chocolate and butter in the microwave. At the same time, beat the two eggs until they're fluffy. Add the sugar to the eggs and continue beating. Then mix in the almond paste, butter-and-chocolate mixture, flour, baking powder, and salt. Once the batter is thoroughly mixed, lightly fold in the raspberries, trying not to break them apart. While the cake is baking, heat the cream in a saucepan over medium-high heat until it just boils. Remove from the heat, stir in the chocolate, and continue stirring until the chocolate melts and mixes with the cream. 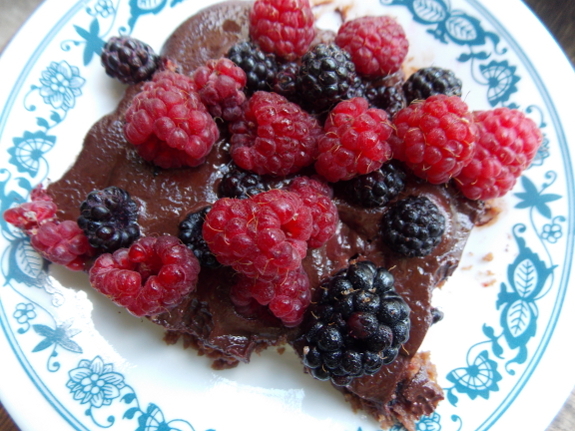 Once the cake is done, spread the chocolate-and-cream mixture over top, then sprinkle on fresh raspberries generously. (We had a couple of blackberries and included them, and I'll be blueberries would be equally delicious.) Cool for a few hours to set the chocolate. Serves about 10 and combines the taste of fresh and cooked raspberries with rich chocolate and nutty almonds, with none of the flavors overwhelming the others. 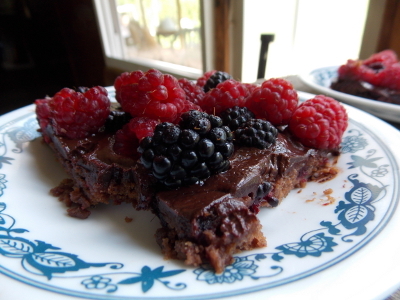 Definitely a favorite for fresh-fruit and dark-chocolate lovers like me! Our chicken waterer is the POOP-free way to make chickens a fun part of any backyard.